The new IPL chairman brings to the table inscrutability, a low profile, a respectability and credibility among his peers, professional competence and an aversion to controversy. 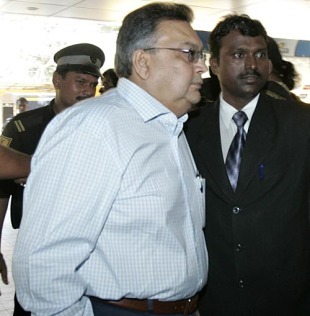 After Lalit Modi, enter Chirayu Amin. The announcement this afternoon that the IPL's interim chairman would be the president of the Baroda Cricket Association drew an underwhelming response and the feeling that the BCCI had missed a trick by not appointing a bigger name who would be equal to the enormous task at hand. Yet that doesn't fully account for Amin's profile: He is chairman of the century-old pharma major Alembic, and a former president of the Federation of Indian Chambers of Commerce and Industry, a top corporate lobby group. His standing in Vadodara, a genteel university town in central Gujarat, is impeccable - apart from Alembic, his family runs a couple of the more sought-after schools - and his personal wealth is likely to leave him unfazed by the scale of what he has to set right. It's fair to say, though, that Amin isn't half as well known as two decades-old company products: Glycodin cough syrup and Yera glassware. What does Amin bring to the table? Apart from the Yera glasses, he brings inscrutability, a low profile, a respectability and credibility among his peers, professional competence and an aversion to controversy. Very much, in fact, the identikit of Shashank Manohar, who said he turned down the job in the first place. Those who have observed him up close in Vadodara say he doesn't talk much, preferring instead to get the work done quietly. His strength in this latest challenge, apart from his corporate skills, will be his discretion; he is unlikely to announce his findings on Twitter. In that he syncs well with Manohar and N Srinivasan, the board secretary. Another asset is his relative lack of enemies, even in the polarised world of Gujarat politics. "He has few friends, because he keeps to himself, but he has fewer enemies," one observer said. Ironically the FICCI presidency, Amin's most high-profile post till now, came about thanks to cricket: the original nominee for the job became the BCCI president. Double irony that AC Muthiah is now ranged against the group Amin belongs to. And the head of the entertainment committee during Amin's term? A certain Lalit Modi, who is still a member of FICCI thanks to his other avatar as president of Modi Enterprises. Back in the day, of course, they were part of the Sharad Pawar group that ended the Jagmohan Dalmiya regime in 2005, though Amin didn't play as crucial a role as did Modi and Manohar; his utility as a chartered accountant came later, when Pawar and co set about unraveling Dalmiya's alleged financial misdemeanours. Since then he has largely been working in the background, serving on marketing and financial committees and providing Pawar and Manohar with his backing in any crucial vote. He has done enough to become one of the five vice-presidents - four, after Modi's suspension - a post he has held since 2004. His cricketing connections in Vadodara are equally low-profile, though his company has lent its name to one of the city's three first-class grounds. He has headed the BCA for almost a decade, coming to power with the help of Kiran More; together, they eventually ended the long reign of Jaywant Lele, the former BCCI secretary, in scenarios replicated across the country - in Jaipur and Kolkata, to name but two centres - by others who would gravitate towards Pawar. His is not a hands-on style and he doesn't talk much but he is said to make it a point to attend managing committee meetings. It's that quiet style that he will bring to the IPL role. That, and a different corporate ethos, one that is likely to include committees and delegation - with oversight. He won't rock the boat but perhaps it doesn't need any rocking right now. Can Chirayu Amin deliver? His best bet would be to emulate the best qualities of Yera - transparent, solid, dependable.